The Jared Goff who seemed like an obvious MVP candidate three weeks ago is nowhere to be seen. In his last three games, Goff has only one touchdown against seven interceptions; compare that to 26 and six over the first 11 weeks of the season. 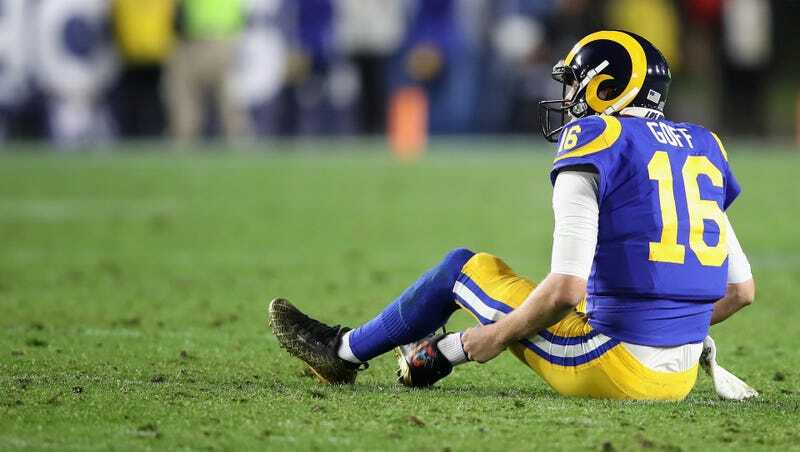 The Rams were perhaps the best team in the NFL through 11 weeks, winning the game of the season and only dropping a thriller to the Saints, in which Goff played heroically. Since winning that Monday Night Football classic, Los Angeles has gone 1-2, struggling to dispatch the Lions two weeks ago, getting crunched by the Bears last week, and convincingly losing to the Nick Foles-led Eagles this week, their first home loss of the season. This is the first time the Rams have lost consecutive games in Sean McVay’s tenure, and while his much-vaunted play-calling ability hasn’t been up to par the past few weeks, much of the blame falls on Goff. As ProFootballTalk pointed out, Goff’s 51.3 passer rating in that stretch is the worst among all NFL starters. His deep ball has abandoned him, which seems to be the product of how defenses are playing him. The Lions seemed to find success disrupting Goff with unpredictable pressure, a game plan which the Bears and Eagles elaborated on with gusto. Defenders have also been playing softer coverage and forcing Goff to throw underneath. Obviously, every team wants to pressure every quarterback, but Goff seems less equipped to deal with it than the others in his tier. As the horror turnover against the Eagles demonstrated, he’s a bit too liable to panic when things break down. And unfortunately, things are breaking down with alarming regularity. Goff didn’t throw a pass for more than 20 yards until the fourth quarter last night, and according to ESPN Stats & Information, he is 2-for-13 with four interceptions on passes that traveled 15 or more yards in the air. Five of his seven picks in the current stretch have also been deep interceptions. Less time in the pocket will dramatically decrease a quarterback’s ability to throw deep, as will fewer weapons. Cooper Kupp has been a favorite target for Goff over the last two years, and he’s been out since Week 10 with a torn ACL. Kupp was not only a rare slot receiver who could be a deep threat, he was a tremendous third-down receiver. Without him, the offense can’t move the chains as consistently. Thankfully for the Rams, they only have games against the Cardinals and 49ers left on their schedule, and the No. 1 seed is still very much on the table. They don’t need to panic yet, but it’s become clear that there are legitimate holes in a team that once looked utterly world-destroying. Was That The Future Of Football?